MORIOKA, IWATE PREF. 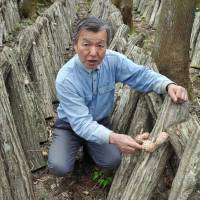 - Kyusuke Sasaki, 63-year-old shiitake farmer in Iwate Prefecture, nearly quit after his mushroom business was knocked out by the March 2011 Fukushima nuclear disaster. But letters of support from junior high school students expressing the hope to see a resurgence in shiitake farming lifted his spirits and encouraged him to press on, resulting in the resumption of shiitake shipments this spring — the first time in six years. Sasaki, whose father had passed down his shiitake business in Ichinoseki, 150 km north of the crippled Fukushima No. 1 plant, is determined to revive Iwate as a major mushroom producer, even though his own production capacity has dropped to less than one-tenth of its pre-disaster peak. 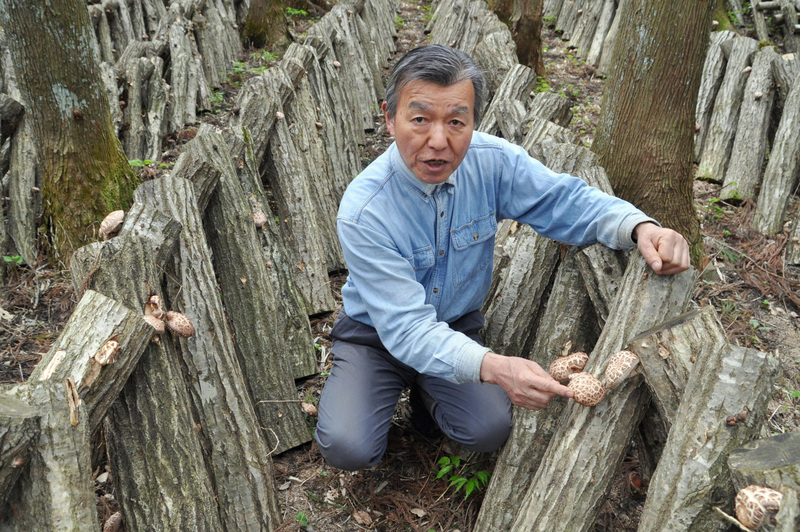 After the government banned shiitake shipments from affected areas in April 2012 due to high radiation levels, Sasaki devised a cultivation method that would meet safety standards by using trees grown outside the prefecture. Together with local students, he planted mushroom fungi on about 2,000 shiitake tree trunks two years ago. Each log is about a meter in length. This past February, Sasaki and about a dozen other farmers finally obtained approval to begin marketing their mushrooms. “Every single one is filled with the heart of every supporter,” Sasaki said. Wild edible plants and mushrooms grown on trees are vulnerable to radioactive contamination because they so easily absorb the elements of their environment, including toxic substances. The triple core meltdown forced Sasaki to stop harvesting mushrooms and to abandon about 20,000 shiitake trunks. Fellow growers gave up farming one after another after receiving compensation from Tokyo Electric Power Company Holdings Inc., which managed the now defunct Fukushima No. 1 power plant. During the uncertainty that followed the shipment ban, Sasaki prepared to resume work by cutting undergrowth for decontamination. He was about to throw in the towel in spring 2015 when a bundle of letters changed his mind. In the envelopes were hand-drawn pictures of shiitake mushrooms with inspirational messages, such as “Shiitake are powerful” and “Never give up.” The letters had been written by schoolchildren and organized by Sasaki’s acquaintance. Sasaki is not sure whether consumers will welcome mushrooms from his farm, but he aims to continue cultivating shiitake and move on to the next stage — i.e., resuming the use of local tree trunks. “It would have been wiser to call it quits, but growing yummy shiitake would be tantamount to returning the favor to everyone (who has supported me),” Sasaki said. According to the health ministry, food restrictions still applied to municipalities in 14 prefectures as of April. The 14 include Aomori and Shizuoka prefectures, which are more than 350 km north and 300 km southwest, respectively, of the Fukushima plant.